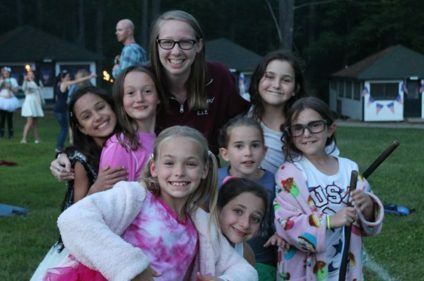 Fernwood Cove CITs learn the importance of giving back to their community through volunteer opportunities within camp and with community organizations. Past experiences have included volunteering on the construction site of a Habitat for Humanity home, volunteering for a local community garden and volunteer days at Camp Sunshine. Depending on school requirements, time spent assisting with camper bunks and leading activities and trip days can be utilized as service hours. CITs can accumulate at least 100 hours per session. Each session begins with Team building days. The CITs and their counselors participate in a multi-day program of team building, low ropes, and high ropes activities. This program provides the opportunity for tremendous growth– both as individuals and as a group. CIT Counselors provide continued facilitation of team building activities on the Fernwood Cove Ropes Course that allow CITs to further develop their problem solving, communication and leadership skills. Each session begins with Teambuilding days. The CITs and their counselors participate in a multi-day program of team building, low ropes, and high ropes activities. This program provides the opportunity for tremendous growth– both as individuals and as a group. CIT Counselors provide continued facilitation of teambuilding activities on the Fernwood Cove Ropes Course that allow CITs to further develop their problem solving, communication and leadership skills. Enroll to be a CIT today! Interested in becoming a Counselor In Training? Contact Jim to receive your online application. Applications are due by November 1 each year. Interviews will be scheduled once individual applications are received. Admission decisions will be announced no later than December 1. Find important information about dates and rates here.